ORLANDO, Fla. — When 17-year-old Chloe Russell’s eyes met those of 41-year-old motivational speaker Jonathan Sprinkles, she felt an instant connection. Standing atop a stage, Sprinkles captivates the student athlete. She could relate, especially his testimony of watching his father deal with cancer. Like Sprinkles, Russell is watching her father — the same man who was her basketball and volleyball coach for years, along with her mother — deal with the disease. The 16-year-old is a senior at Cathedral High School in Indianapolis. She overcame an ACL injury and harbors a passion for social justice as a member of her school’s Undoing Racism team. A volleyball and basketball player and track athlete, Russell is a 4A volleyball state champion. She plans to major in health sciences and minoring in Spanish, with aspirations to become a doctor of osteopathic medicine with her own practice. “I think the whole Disney Dreamers is just an awesome experience. This is such a great opportunity. I’m super grateful and ready to Be100,” Russell said. For Sprinkles, pouring himself into the support of others is more than a full-time passion and commitment. He’s championed the session for the Dreamers for 10 of the 11 years that Disney Dreamers Academy has existed. “It does replenish me,” Sprinkles told The Undefeated. “Talking to them, sharing with them, seeing their look in their eyes. I got to see something that you didn’t. I get to look in their eyes and see the lights come on, and when it all comes together it’s something special because they now see, ‘You know what, I deserve this. I do have a place at the table.’ And when you see that, that’s the payment. To me this means I get to do for them what was done for me, which is have somebody speak into my life and show me that I can do it. One by one, at the conclusion of Sprinkles’ interactive discussion, the Dreamers voiced their takeaways from his speech. Sprinkles, standing in amazement, told the students that they summed up everything better than he could. Hudson Osborne was also motivated by Sprinkles’ address. On day two of the event, Osborne feels he’s in the right place at the right time. The 15-year-old is a ninth grader at San Lorenzo High in California. “I play on the football and basketball team. I enjoy speech and debate, also criminal justice,” he said. 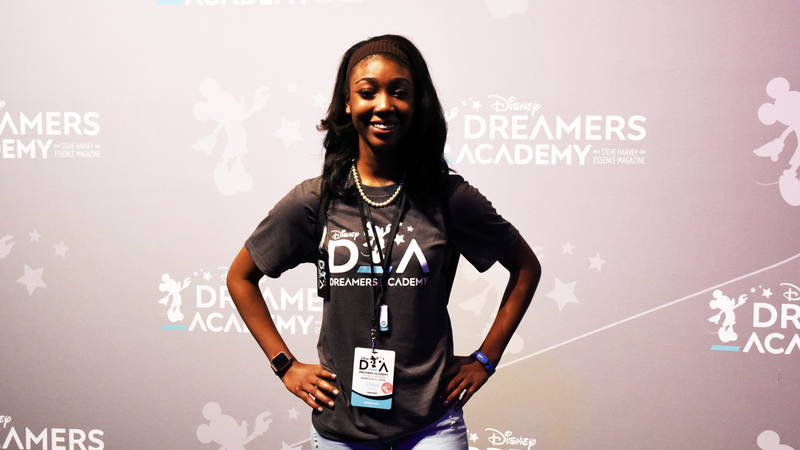 Those big dreams are in line with the mission of the Disney Dreamers Academy, and day two for the Dreamers is more than in the books — it’s part of students’ newly transformed minds.